This sketch by Manet of Gustave Courbet, the French master from a generation earlier, is not just a reproduction of what Courbet looked like. 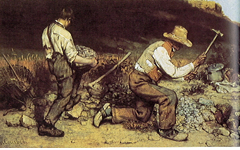 Even though Courbet was seldom seen without a pipe during his life and it became a near-essential part of his image, Manet nevertheless used it to symbolize what was common about their imagination. Manet, Portrait of Courbet (n.d.) Pen and ink on paper. Private Collection. 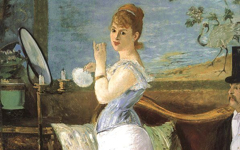 To demonstrate that he himself was Courbet's successor as "the greatest French painter", Manet drew a line of smoke from the pipe bowl in the shape of an M, for Manet (see diagram at right). It appears in the same looping style of his signature, though somewhat looser given that it is "smoke". 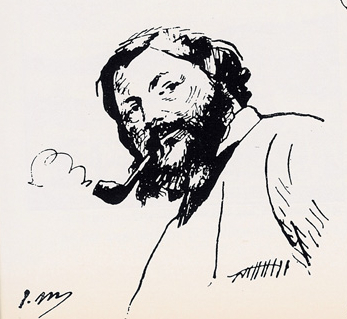 In the early years of the twentieth century, a minor French painter, Paul Helleu, drew a sketch of a British painter, Augustus John. 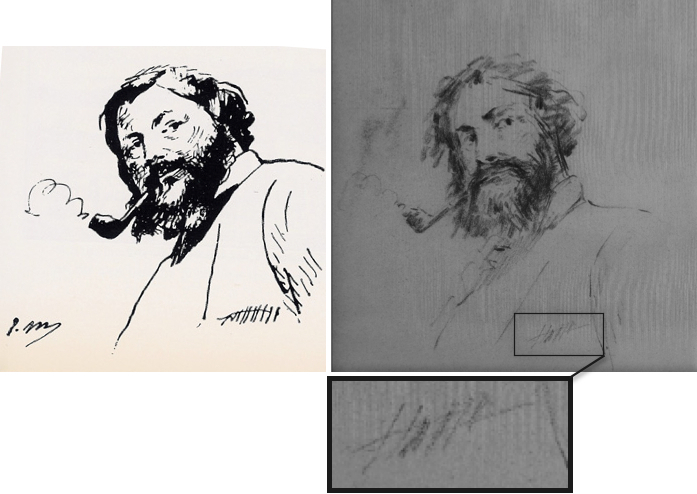 Even though the reproduction here is poor (right), Helleu clearly used Manet's sketch of Courbet as the basis of his own even though the link has never been noted. R: Helleu, Portrait of Augustus John (n.d.) Simonow Collection, France. 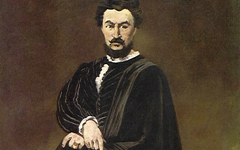 What is interesting is that Helleu must have known that Manet identified with Courbet. The catalogue of the Simonow Collection, from which this drawing comes, identifies the mark at lower right as Helleu's signature, unaware of the link to Manet's portrait.1 It is not a signature, though, but a jacket pocket with the left end altered to suggest an H, for Helleu. The rest is illegible. Thus, just as Manet turned smoke into an M to indicate his alter ego, Helleu used the pocket for the same purpose. Even a minor painter knows that "every painter paints himself." Original Publication Date on EPPH: 09 Dec 2010. © Simon Abrahams. Articles on this site are the copyright of Simon Abrahams. To use copyrighted material in print or other media for purposes beyond 'fair use', you must obtain permission from the copyright owner. Websites may link to this page without permission (please do) but may not reproduce the material on their own site without crediting Simon Abrahams and EPPH.